Scandinavian Airlines announces it will stop flying to Tel Aviv as of March, cites political instability. Scandinavian Airlines (SAS) announced on Monday it would be stopping its flights to Israel, citing “political instability” as being behind the decision. In addition to flights to the Ben Gurion Airport in Tel Aviv, the airline also announced it would no longer include Moscow and Ankara among its destinations either. Flights from Copenhagen to Tel Aviv will cease in March of 2016, the airline announced, a little more than three years after Scandinavian Airlines launched its flight to Israel. "The route to Tel Aviv is expensive to operate and is under tough competition and we do not have sufficient profitability to continue to operate it. 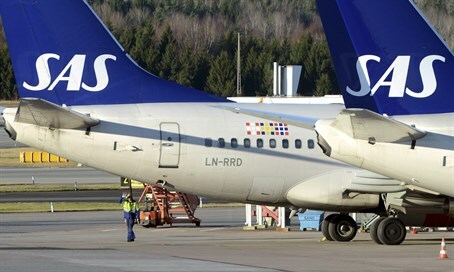 We can also see that the political instability affects the route," a spokesman for SAS told the Check-in.dk website. In July of 2014, in the midst of the counterterrorism Operation Protective Edge in Gaza, several airlines halted flights to and from Israel following a rocket strike in the area. Those airlines included U.S. Airways, Lufthansa, Austrian Airlines, Germanwings and Swiss Airlines, Delta Airlines and United Airlines. It remains unclear whether Scandinavian Airlines’ decision is related to recent tensions between Israel and Sweden, where the airline’s headquarters are located. The announcement of Sweden's recognition of "Palestine" last year saw withering verbal jabs about IKEA furniture between then-Foreign Minister Avigdor Liberman and Swedish Foreign Minister Margot Wallstrom, as well as Swedish financial institutions boycotting Israeli companies. Israel also temporarily withdrew its ambassador from Stockholm. Wallstrom at one point announced she was indefinitely postponing a planned trip to Israel and Israel later said that Wallstrom was not welcome for an official visit in the country. The Swedish Foreign Minister subsequently accused Israel of “irritating its allies” with its reaction to her country’s recognition of “Palestine” and added, "It is unacceptable how they have been talking about us and everybody else."